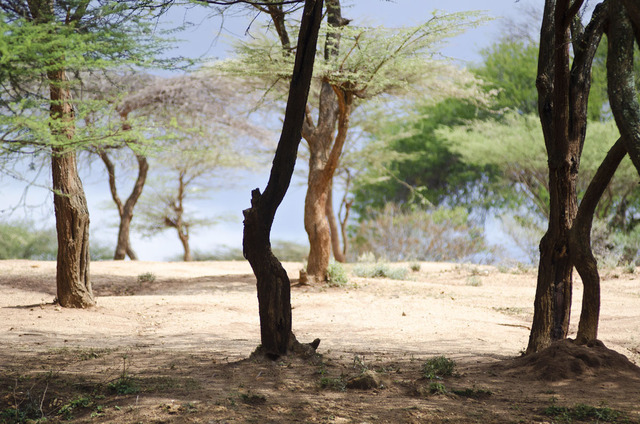 Women and children formerly would walk 4 -10 km to the top of a hill to retrieve water. 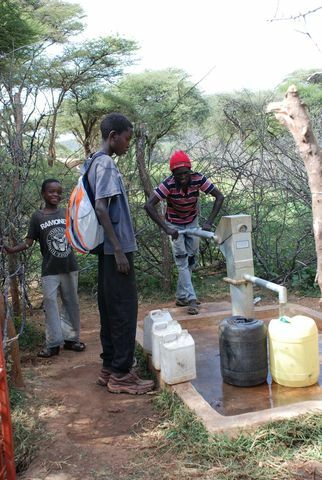 Now the well is within the village and they walk less than 1 km. They used to scoop soil for water that was polluted by animals and was therefore extremely unsanitary. 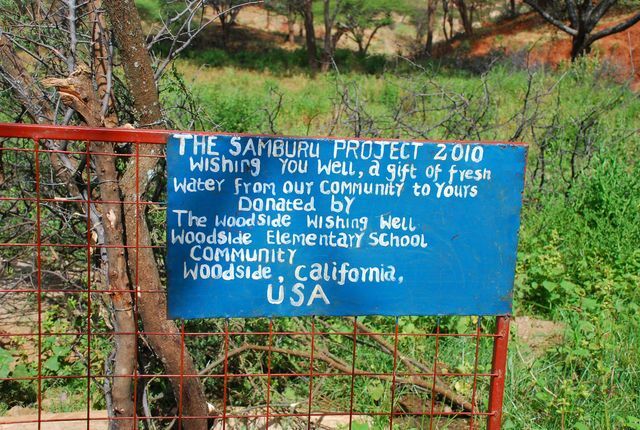 The well has allowed for clean water. It is easier for them to use and they no longer have stomach aches. Women have time for business and to go town. They have more time for child-rearing and to oversee their families. Previously the women had back problems and some miscarriages due to the weight of carrying water over such long distances. 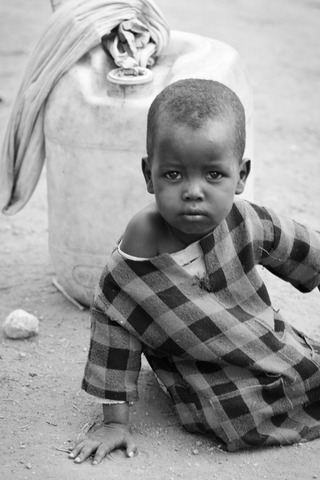 Children have time to go to school because water is now closer to home. Lucas and I walked to this well very early in the morning as we were hoping to leave Wamba and travel to Archer’s Post later in the morning. When we arrived, I was surprised at first that no one was present at the well. However Lucas reminded of the rains the night before. Recalling this storm, I honestly do not think I have witnessed such heavy rain ever in my life which went on for the better part of the night and early morning. Because of this rain, Lucas presumed that the women probably were sleeping in or taking their time to come to the well because they knew that the farm was well watered the night before. As I just alluded to, there is a beautiful farm right next to the well that is fenced off from the outside. Many aspects of this farm including the sturdy chain-link fencing around the entire farm was funded by M. Night Shyamalan Foundation. This farm was flourishing with many different crops: I saw a pepper tree that was already bearing a lot of green peppers; there were rows and rows of kale; we spotted a sugarcane plant; at the front near the other side of the fence was a pumpkin patch that was beginning to flower; Lucas pointed out a tree that bears peanuts. 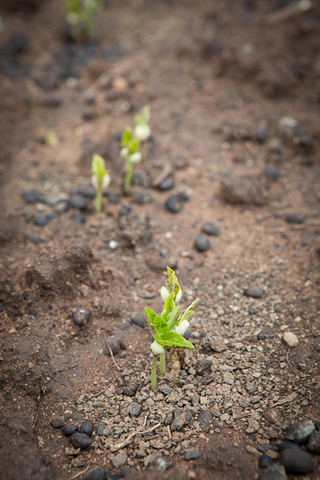 I am sure there are many other kinds of crops they are growing but those are the ones that Lucas could easily identify. Lucas informed me that this community is hopeful that this harvest will be very plentiful and fruitful. 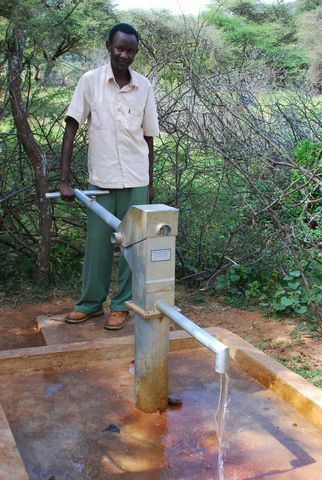 As for the well which is located next to the gate, there has been no problems with any of the hardware and has been pumping enough water to nourish both the crops and the people. 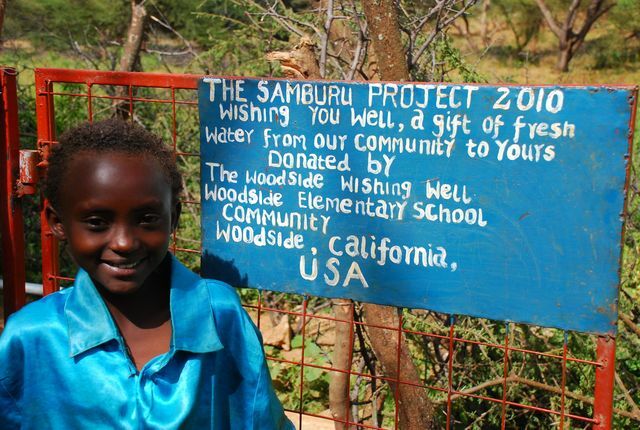 This was the busiest well, close to Wamba and with a community garden. It was a lovely spot, shady and fragrant thanks to the well giving life to the garden. 26 families are members of the garden, they have nursery beds and then transplant. It was close to harvest time and everything looked lush. We saw lots of kale, peanuts and I think some corn. This well is guarded 24 hrs a day because it means so much to them. 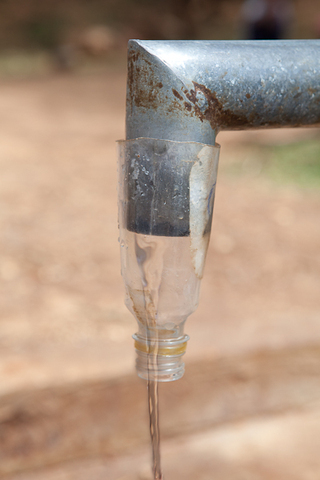 Visitors are charged the small fee of 50shillings for water. Previously water was sourced from the river which was salty. There were some Muran present and they had filled bowls for washing clothes but took them down by the river so as not to contaminate the well. We met the delightful Peter Olesawa who learnt excellent English in school back in 1962! While on a walking photo safari, we stopped by the Laga Farm and Well. The place looks beautiful with lots of veggies growing though Peter and Mary Nyambura, two of the twelve farmers, told us a story of elephants and how they destroyed the farm some time ago. They both pleaded with me for a barbed wire fence. 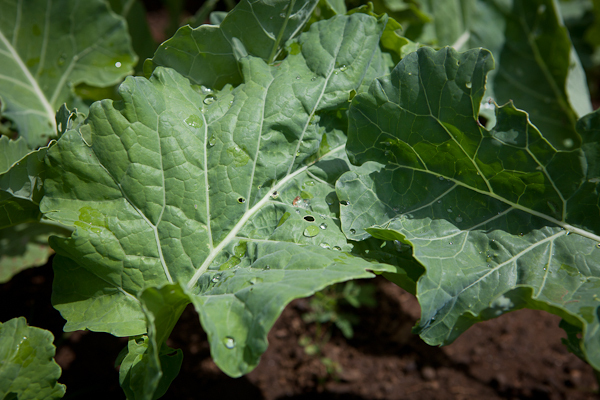 They are making about 1500 KES/day on the sale of their produce. The money is put back into the farm as an investment. Overall, spirits seem high and the community is encouraged to expand and improve the farm. 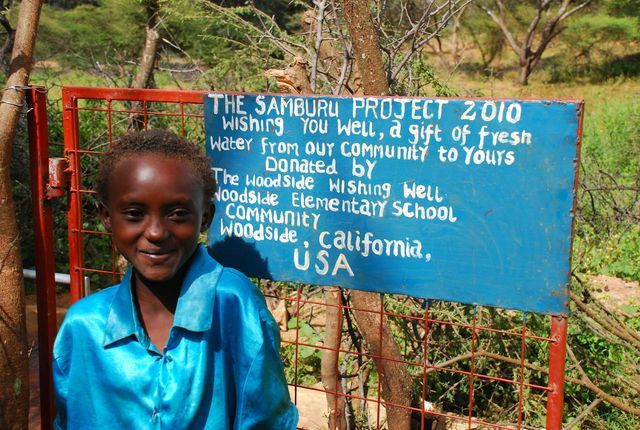 Community health has improved because community members no longer are forced to scoop soil to get water as they had to do before the well was installed. The level of pollution in the water from animals as well as its generally unsanitary nature caused stomach aches throughout the community. However following the installation of the new wells, the prevalence of stomach aches has subsided. 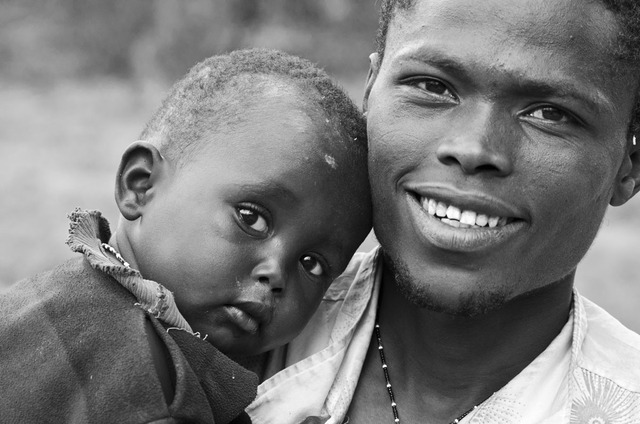 Women have more time to go to town, oversee their families and children, and participate in income-generating activities. 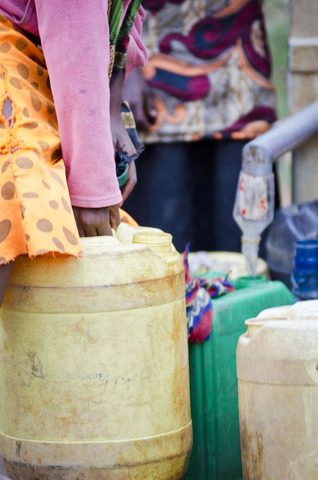 Previously community women had back problems and some miscarriages due to the weight of carrying water over such long distances. 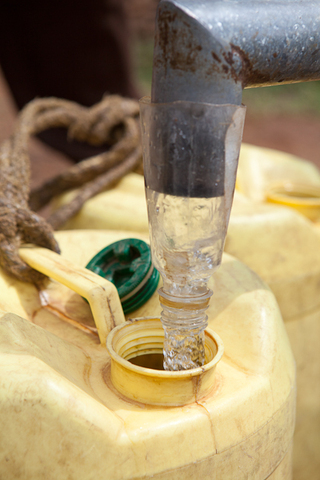 The well eliminates the need to spend long periods of time carrying water over larger distances. 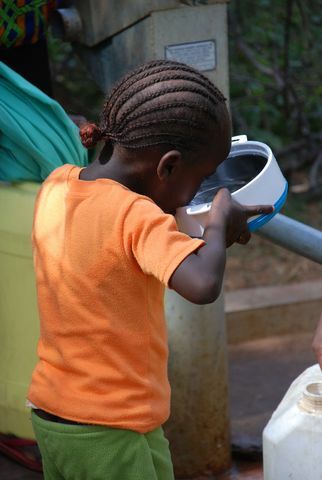 Children no longer have to travel with their mothers to fetch water and, as a result, have more time to go to school.